Hi, I’m Jess and I’m a guilty recycler. Yep, there was a time last week when washing out the sauce bottle felt as though it was just waaaaaay too much like hard work. Particularly when it didn’t clean itself easily the first time. Then came the dilemma – Option 1: Keep washing the stubborn crusted sauce, 2/ Slide it into the recycling crusted sauce and all, or 3/ Send it to landfill. By the time you’ve thought that much about it you know you’ll feel guilty if you DON’T wash it out – but you just want to get the damn kitchen clean as fast as possible!! That’s before the upcycle pressure hits – what else can I do with this sauce bottle? What else SHOULD I be doing with it? Now there’s great news. No, we’re not going to pop over and rinse your sauce bottles, but you can overcome your recycling and upcycling guilt by upcycling and recycling your packaging from The Kids Book Company. Yes ! We have new shipper packaging. This wouldn’t normally be particular cause for celebration but in this case, it’s an opportunity to both give the kids another activity to do AND offset a bit of the carbon used to get the book to you in the first place. We’ve made the shipper out of compostable cardboard, and printed it with vegetable inks. This means it can transform into a planter – then you can plant the whole thing directly into the ground! Yes, there are cut lines and instructions. There’s open spaces for colouring in or painting… (use friendly colour though, it is going in the ground after all) and trust me, it’s easier than it looks! So, make a planter and teach your kids about growing. Grow something easy and edible from seed like beans, peas or the spring onions (like Sophie has been growing in our first tester). Perhaps try a couple of lettuces or rocket. Better yet – grow a tree…! 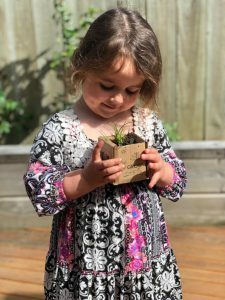 Upcycle the packaging, teach your kids to grow something and never again feel like a guilty recycler. 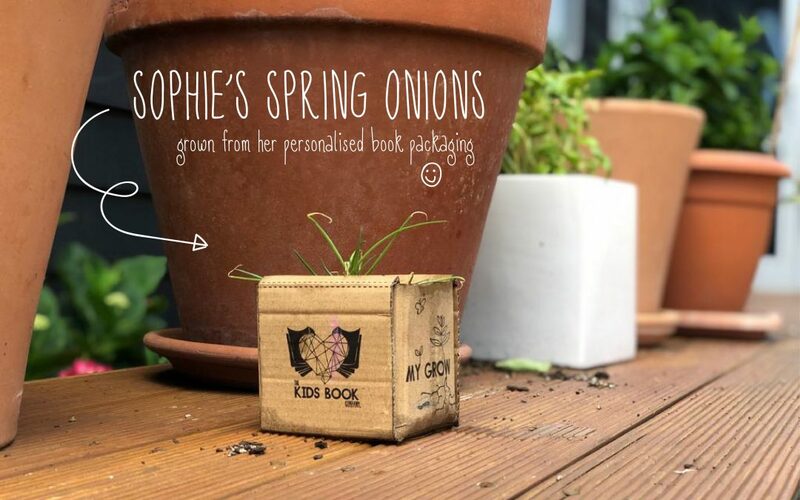 Sophie admiring the spring onions she has grown in The Kids Book Company’s new up-cycled packaging – yes, the shipping cardboard that her personalized kids book arrived in! P.s. We’d love to see photos (including progress pics) of what you grow, so post it up and tag us in or send it to us. P.P.s If the kids get really into it, the cardboard center of toilet rolls works super well too – you can plant them right into the ground as well.